Life Is Like a Library: What If? What if you were doing what you usually do on a normal day, and all of a sudden it starts raining? But then it doesn't stop raining. Sixteen-year-old Sebah is caught in what turns out to be "The Flood." She ends up as a stowaway on Noah's Ark and is a witness to all that goes on. There is no spoiler alert necessary because I'm not including any spoilers. I am usually not a fan of books based on biblical stories that push creative license to the point of blasphemy or heresy. But Ms. Napoli did her research in many areas (and I do love an obviously well-researched book). The time frame stays true to the biblical time frame as to when the rain stopped, when the mountain tops could be seen, and when everyone finally got off the Ark. The animal behavior, particularly some fun-loving primates, is also accurate, as are the descriptions of the foods and plants. She even includes the midrash of Og, the King of Bashan, riding on top of the Ark. While reading the book, many things came to mind. In a way, STORM fits in the current trend of dystopic books - having the violent, evil world destroyed by a flood is pretty frightening, and the details of how Sebah deals with life on a daily basis, while retaining hope for the future, is what keeps the book moving at a steady pace. It also brought back fond memories of APE HOUSE by Sara Gruen, another great book. While many children's book portray Noah happily feeding the pairs of animals, Napoli explored the interaction between the people on the Ark. When you think about it, spending days cooped up in the rain makes people tense and irritable, especially when they spend those days feeding and cleaning up after animals. For those who may worry, I checked all the biblical passages and calculated the days myself, and the book does not veer far from the original story. I continue to assert that Noah was not Jewish, since Abraham was the first Jew (10 generations later). So while the story of Noah is not a particularly Jewish story, it is a biblical one. Napoli's tale is gritty and imaginative. To quote the author: "people who are religious can open it without fear of having what they hold dear being trampled. New perspectives can sometimes support old ones in an enriching way, rather than supplant or denigrate them." STORM poses that challenging question to the reader. What if? What if you were on the Ark? How would it smell? (Probably pretty bad). What would you eat? How would you pass what little free time you had? How would you feel before, during, and after the rain? Were there rainbows before God "set his rainbow in the cloud" and promised "the water shall never again become a flood to destroy all flesh." (Genesis 9, verses 13-15). Do you think the world today would qualify to be flooded? The book is appropriate for both young adults and adults. Young adults will identify with the 16-year-old Sebah, who deals with a combination of dystopia, Big Brother and Survivor. 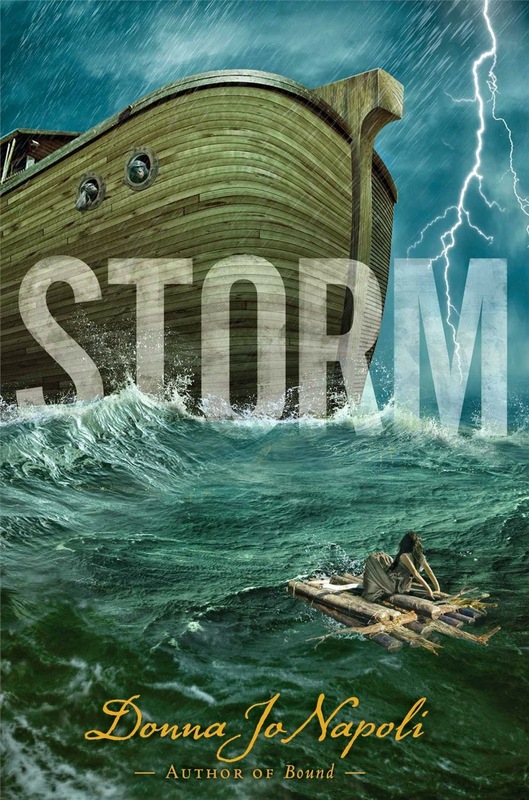 Adults will appreciate how closely STORM follows the biblical account.